Getting good sleep has a dramatic impact on one’s quality of life. It can be particularly challenging in the nomadic lifestyle to get consistently good sleep when you’re bedroom environment is constantly changing. Today we talk with Bernie Miller, a sleep specialist at the Mayo Clinic in Arizona, about things you can do to ensure you get the best possible sleep while on the road. In this conversation we cover ramifications of getting poor sleep, the factors that contribute to getting good sleep, the distinction between REM and deep sleep, pro’s and con’s of various natural and artificial sleep remedies and how to know when it’s appropriate to seek an appointment with a sleep specialist. With seventeen years of experience Bernie is a domain expert and very knowledgeable on this subject. Enjoy our conversation. 0:03:07	What factors affect one’s quality of sleep? 0:05:51	What are the ramifications of getting consistently poor sleep? 0:07:03	What is the optimal amount of sleep for someone to get nightly? 0:08:29	The younger you are the more sleep you need? 0:10:26	What does it mean when you rise too early and fail to fall back asleep? 0:11:52	What about computer usage at night? 0:14:01	What about dietary recommendations for sleep? 0:15:03	What about sleep-inducing qualities of chamomile tea? 0:15:41	What about variables we can’t control like changing sleeping environments? 0:17:47	How do you feel about Melatonin? 0:18:29	Are there any harmful side effects of Melatonin or risk of becoming dependent? 0:20:10	Can you talk about the distinction between deep sleep and REM sleep? 0:21:26	Do they know what’s happening during REM sleep? 0:22:27	How does one know if he/she has sleep apnea? 0:23:45	And this is something different than narcolepsy right? 0:24:45	When is it appropriate to seek a sleep study? 0:26:05	What is the effect of alcohol on sleep? Sean Tierney – 00:21 – The quality of sleep you get has such a huge impact on your daily existence. Get a couple bad nights of sleep and you diminish your ability to function the next day, get chronically bad sleep and you can be contributing to a host of serious health issues. Sleep is important and it can be extra difficult when you’re constantly on the road living the nomadic lifestyle and your sleep environment is continuously changing. Today we’re talking with Bernie Miller, a sleep specialist for the Mayo Clinic in Arizona, who has been treating sleep disorders for nearly two decades. In this conversation, we talk about some of the ramifications for getting consistently poor sleep factors that contribute to good sleep, things you can try if and when you suffer from sleep issues and how and when to know when the situation merits seeing a sleep specialist. Sean Tierney – 01:05 – Bernie is clearly a domain, a domain expert on this stuff, and this topic hits personally close to home in that it’s something that I personally have wrestled with. So I’m very excited to share with you now. My conversation with Bernie Miller of the Mayo Clinic Nomad podcast is supported in part by nomad prep and online academy that teaches you everything you need to know to take your job on the road and crush it abroad. Enroll today at nomadprep.com/podcast and get your first four days of training completely free. Nomad prep. Take your job on the road and take on the world. \Okay, welcome Bernie Miller to the podcast. Thank you for joining. Bernie Miller – 01:43 – Thank you. Bernie Miller – 02:19 – I’m with the Mayo Clinic Center for Sleep Medicine in Phoenix, Arizona and been here for probably about 17 years now. It wouldn’t be my guest admitted that, uh, I’m an assistant professor of medicine here, a clinical sleep specialist for the sleep center. I’m assistant professor. I already said that in medicine and I also teach at the Mayo Clinic Medical School here and I’m a faculty there too. So the newness for quite a while. Yeah. Great. I think what qualifies me to answer some of those questions is I haven’t got a couple friends who do this so. Sean Tierney – 02:51 – Perfect. Well I’m excited to have you here just because like I said, this hits close to home. Me, personally, I’m struggling with issues related to. And I think maybe the place to start. Can you just give us an idea, like when you’re thinking about sleep, I know there’s a lot of factors that contribute to getting good sleep, but what are the things to be thinking about, like what is involved at a high level, what affects the quality of sleep that one gets? Bernie Miller – 04:17 – Oh yeah. Well coffee intake is certainly something that America loves to do. Um, the average cup of coffee has about 137 milligrams of caffeine in it though. And according to some new research I recently read that it takes about 250 milligrams to maintain an alertness level for about two and a half hours. So what happens of course, is people who have four or five or six cups of coffee are going to build up some caffeine and their system and it’s not really a, gotten rid of as quick as, you know, as quick as we think it is. So really if you’re, if you’re a nomad and you travel a lot and you’re having a lot of trouble sleeping, I would probably try to be pretty stingy with the coffee. Maybe switch to decaf because you know, depending on, of course, what time zone you’re in, do that’ll affect that. So when you drink coffee is very important to. I mean we actually, uh, use that. I, I did a talk to some nurses a awhile ago and on the night shift they actually kind of suggests coffee intake as a strategy to maintain your alertness level. Bernie Miller – 05:24 – So you can also do it, use it for that too. But if you’re going to be traveling and having difficulty sleeping, I would really try to lay off the caffeine for sure. Sean Tierney – 05:33 – Yeah. I personally don’t drink coffee. I drink tea though. It has a lesser amount of caffeine as I understand it. Bernie Miller – 05:40 – I think there’s about 80 milligrams a and t, so yeah, considerably less. Sean Tierney – 05:48 – Well before we dig into the specific strategies and the things involved with sleep. Maybe let’s even go a level above that and talk. What are the ramifications of getting bad sleep? Like I know that there are, at least I understand that there’s been ties to like Alzheimer’s and reduced cognitive function. Can you talk about what, what is the impact of getting consistently poor sleep? Bernie Miller – 06:11 – Oh, for sure. I mean pretty much everything you said plus your reaction times are going to be slower. You know, you’re going to be moody. While we actually see that with a lot of our sleep apnea patients, because no matter how long they sleep, their sleep is terrible quality because they’re always arousing out asleep. If you don’t get really good quality sleep and is not stable, you’re not going to get the restful sleep you need, you know, also, uh, you know, that’s really big of course in children because that’s when they secrete growth hormone and stuff like that when they sleep. So if they’re getting bad sleep, but there are definitely in debt, a definite detriments to not getting enough sleep for sure. And some recent studies they’ve even showing where now they think that too much sleep. I’d actually be bad too. So. Sean Tierney – 07:00 – Well. So what is the optimal level of sleep? If it is a not just a like getting enough is a matter like it sounds like if you can get too much sleep and what is the optimal zone of the right amount of sleep? Bernie Miller – 07:12 – Yeah, the uh, I read a cardiology study the other day and they said about six to eight hours, so six hours would be a minimum. According to the American Academy of Sleep medicine though, there’s actually a much wider range and it’s based on what your age is. So for instance, a high school age kids. So you’re talking like, you know, 16 to college age 25, they need a lot more sleep. They need about nine hours of sleep and the name me a high school kid that gets nine hours of sleep a night. Yeah. School start times or so, you know, so, so early in the morning and they go to bed so late that uh, you know, they’re definitely not getting the sleep they need. So I’m usually about seven to nine and is what the recommended is for most age groups for a by the American Academy of Sleep Medicine. Bernie Miller – 08:37 – That actually is not a not an unfair statement to make and are really, it is that way. Obviously infants sleep a long time and adolescent sleep more and really just starts to drop off after, after about 25, 25 to about 55. You need that seven to nine. And they really originally found out that, you know, like 65 and 70 and over, you actually need a little bit less, but you’re still talking at a minimum they suggest. Sean Tierney – 09:08 – Yeah, I mean to me it’s such an important thing because it is, it’s not as simple as like it’s a nodded issue. Right? So if you, if you’re getting poor sleep, that can lead to poor cognitive function, which can lead to more stress, which can lead to worse sleep so we can actually have this negative spiral if it gets kicked off. Bernie Miller – 09:28 – Yeah, it’s a vicious cycle. I mean, that’s, that’s, that’s what happens with insomniacs, you know, um, all of a sudden after a few nights of not sleeping very well, then you say you start to say things like, well, I have to go to sleep and then you go to bed and you try to go to sleep. Well, you shouldn’t have to try to go to sleep and then it becomes work and you know, just like you said, Sean had just kind of snowballs into a, into bed, becomes work, and then you’ve got full blown insomnia. So. Sean Tierney – 10:01 – Okay. So I’ve been in that position, unfortunately, I’ve gone through a bout of that. Knock on wood, I’m not there now. And um, I’ve got kind of like the rituals that let me fall asleep, that I kind of use like a diffuser with my essential oils and I’ve got kind of this wave machine thing that seems to help. Yeah. I’ve been afflicted with this lately. I would, I would ask you this, and this is obviously just a personal question, but what does it mean? I don’t so much anymore. I have trouble falling asleep, but I tend to get up at like 5:00 AM and not fall back asleep for an hour. And I don’t know why that is. But do you see people who wake up from sleep at abnormal times? Bernie Miller – 10:39 – It’s kind of a sleep maintenance insomnia issue too. And that actually kind of comes into play more as we age as we get a little older. We started to have a little of that, a sleep maintenance insomnia where we might wake up after three to four hours of sleep. Now there’s also a couple of sleep disorders associated with that too. There’s advanced sleep phase and delayed sleep phase and it can be related to that stuff, but as long as you can wake up and go back to sleep, yeah, you’re probably going to be fine. No. Yeah. Another mistake people make is they lie in bed trying to fall asleep and they all lie there. Like I get patients to tell me why I lie in bed for an hour, hour and a half sometimes before I fall asleep. Well that’s your first mistake, you know, don’t lie in bed for an hour and a half if you’re not asleep after 20 minutes, you know, get up, leave the bedroom, do something else. And then, you know, like read a book or something and then returned to the bedroom when you’re tired. Yeah. So that would be a strategy for that. Sean Tierney – 11:45 – Well, yeah. So let’s talk strategies. Um, you mentioned for instance like using computers, like the folks on the road are almost certainly going to be all knowledge workers working on their computer. So that’s gonna come into play. What’s the recommendation there? I know you, I’m guessing you’re going to say not to use it past a certain time. I would, I would think. Bernie Miller – 12:04 – Yeah, there is a, actually a couple recent studies about the blue wavelength that computer screen seemed to. We met and as the blue wavelength that really helps set our reset, our body clock and all that’s done unfortunately through the optic nerve. Okay. So you know, you look at something bright and the blue wavelength hits your optic nerve. Then it sends a signal to this little thing in your brain called the super charismatic nucleus, which is actually your body clock. And then it says we’re awake. It’s time to be awake, you know, because of the brightness of the blue, a blue light. So you’re really shutting a should avoid, um, computer screens at least probably at least two or three hours before bedtime. Sean Tierney – 12:49 – Yeah. So I try to, whenever possible, um, some of us that work in Europe, like right now I’m in Portugal, have to maintain us hours and so it will be on calls into the night. I use something from my computer called flux, which on a Mac it, it takes the blue wave length out after sundown a nice and there’s something called night shift for the iPhone that will do the same thing on your phone. So it’s not ideal, but it’s a strategy for the folks listening that there, there are some ways to at least mitigate the, the blue wavelength issue. Bernie Miller – 13:51 – Maybe you’ve made it, a ritual goes down and you go down. Sean Tierney – 13:55 – There you go. Cool. All right, well, so um, so that’s computer strategies. What about, you mentioned diet is a potential effect, but I’m assuming foods as well, is there any type of foods that we shouldn’t be eating past a certain point? Bernie Miller – 14:12 – Yeah, most mostly people think you shouldn’t go to bed hungry. Okay. Um, but you also shouldn’t go out there and eat a huge meal either and it’s carbohydrates to really keep you awake because carbs your body really has to work to digest carbs and that will you fragment your sleep and keep you awake. So uh, you’re better off too if you have like a protein snack or something before bed, probably better off with proteins because carbohydrates will help wake you up and your GI system has to work harder with carbohydrates. So. So maybe a little quick protein snack and I mean if you’re looking at that and you might as well have Turkey, Turkey, hell’s ultra domain and it do. So. Oh, that’s asleep. Do her saw that actually may help you sleep a little bit. Sean Tierney – 15:00 – Okay. What about things like, I’ll do like a chamomile tea. Is there any validity or sleep inducing qualities to that or is again, that just kind of more. Bernie Miller – 15:10 – I think that’s more of a personal, personal preference, relaxation and placebo effect to a lot of people. But uh, yeah, there are um, many people use a combination of that tea and relaxation and stuff like that. Kind of online for the day. Yeah, of course. Like you said, you do have to be careful of the caffeine. Right? Just make sure you’re drinking the tea without caffeine. Sean Tierney – 15:34 – So herbal herbal only. No Caffeine tea. Bernie Miller – 15:36 – Yep. Sean Tierney – 15:37 – Okay. What about anything? So, you know, some of these variables we can control things like diet and computer usage and whatnot, but some like the changing environment, it’s just that is what it is. There’s no way to get around it. If you’re moving every month or every week you’re going to have a new bed, you’re going to have a new, unfamiliar environment. Um, are there anything we can do to control for that factor, like changing that or. Bernie Miller – 16:02 – Well, obviously that’s definitely a big issue. I mean, because everybody, the, uh, you know, you have what they call first. We call first night effect and we have that in our patients that we do sleep studies and sometimes do they have first night effect when they just can’t sleep. I’m like, even when I go to a conference or something, I’ll know that first night my sleep is terrible. Second night, a little bit better by the time I’m ready to come home, I’m sleeping pretty good so I disrupt that. But I’m also, uh, if you are traveling by air, it’s usually easier to move your body clock forward and it is backwards. So if you move back in your time zone you can look forward to having more issues but forward in your time zones. It’s easier on your body so you have less issues. But I would consider a at least taking a couple of familiar items with me, familiar bed items to kind of make it, make the foreign bed your own and probably help your mind relax a little bit and stuff too. And now now a lot of travelers to. They buy those sleep sacks that they have now. Bernie Miller – 17:10 – Oh, it is just like a. it’s kind of a silk or satin material and you actually slide into it like a sleeping bag and that’s because a lot of people now don’t seem to trust hotel sanitation very well and stuff. So they actually take one of these devices with them and slide in between those and sleep that in the bed. Okay. Interesting. But uh, but yeah, take it like a familiar pillow or something. Anything that can help relax you. Of course. Also there’s a Melatonin. Sean Tierney – 17:42 – So my next question is how you feel about Melatonin as a sleep aid? Bernie Miller – 18:45 – Not, not that I’ve ever heard and I’m usually just just for traveling purposes and jet lag and stuff, you would only take like three milligrams of Melatonin and then they’ve actually given laboratory animals 3000 times in a normal adult human dosage and it has had no harmful effects for them, so they’re not really worried too much about the harmful effects of Melatonin and it’s also a powerful antioxidant. There are some advantages that the. The thing that is difficult with Melatonin is the timing. Okay. Okay. And usually that ends up being a two hour to 45 minute timeframe, so some people benefit taking me two hours before bed and others benefit taking it just 45 minutes before so that you would have to kind of find that sweet spot for yourself most likely. Sean Tierney – 19:38 – Okay. But that’s good to know that maybe that concern is unfounded, that it could become an addiction, a glass of something like an Ambien or of one of those. Bernie Miller – 19:48 – Oh, no, no, no, no. And we actually, uh, there is a sleep disorder called Rem behavioral disorder that we can use Melatonin to treat, uh, with some success. And we give those patients like 15 milligrams. So I, I’m pretty sure a Melatonin safe substance. Sean Tierney – 20:07 – Okay. Can you talk a little bit about the distinction between deep sleep and REM sleep and what this, like what, what, what does, what, what, what is the function of each and what does it mean? How do you know when you’re working? Bernie Miller – 20:20 – Well, deep, deep sleep, what we call it, Delta sleep, our state’s three and three sleep. That is the deep and restful sleep that you get. And usually that occurs within the first three to four hours that we’re in bed. Galen, usually in the first third of the night, you have your restful Delta Sleep, um, that you have REM periods interspersed throughout the night, usually three to five REM periods. And the first one will be short, the second one will be a little longer, um, and the last one, and during the, just before you wake up, you will usually have the longest, most intense period of rem sleep. And, uh, it, it’s total makeup is about 25 percent of your total night sleep. But during REM, we’re really not resting. Actually. REM is pretty busy or our bodies actually in a state of paralysis during REM. So you really can’t move. But, um, our brain is really working overtime. In fact, our oxygen consumption increases about 50 percent in our brain during REM sleep. Sean Tierney – 21:23 – What’s happening during this period? Like what is actually going on? Bernie Miller – 21:27 – Well, there’s several different theories for that. And the most accepted one is the, uh, back up your hard drive theory. You know, that your brain is actually just sorting out stuff and putting it where it belongs in your brain, you know, and that’s pretty much the most accepted theory. And during REM your blood pressure actually fluctuates a lot and the only muscle you have have a that works is your diaphragm for breathing. So a lot of patients, if they have sleep problems and stuff like that, or sleep disorders, it will be much worse during, like our sleep apnea patients, uh, they, they don’t breathe well, you know, anyway. And once they hit ram, they usually their oxygen level usually drop in their amnesia usually gets much worse because again, the only muscle of reading work and is your diary. So I’m so REM sleep is actually our bodies probably resting because it’s in the state of paralysis, but our brain is really working overtime. Sean Tierney – 22:26 – How does one know if they have sleep apnea? I supposed to do a sleep study to find that out. Or is there another way for someone to self diagnose whether they have something like sleep apnea? Bernie Miller – 22:37 – Yeah. One of the things to really watch out for as a maybe all of a sudden you’ve got high blood pressure. He didn’t have it before. Um, you’re really loud, snore, you know. Um, I’ve had some, uh, some gentlemen would go to a hunting camp with their buddies, you know, and then the next night they would sleep out in their pickup truck because they got kicked out, you know, from loud snoring and things. And of course it’s nice to have a better partner to complain and say, you know, you’re snoring early, bad or a or I heard the, you know, I even heard he was stopped breathing during the night, but we’re not on the symptoms of that for an individual that you could recognize would be get really sleepy during the day. You know, if you have really bad sleep apnea, your sleep is fragmented sometimes 100 times a night. I’m even though you don’t know it, it’s an insidious disease so you know, creeps up on ya. But I’m loud. Snoring and daytime sleepiness is really the big one. So they would have trouble driving long distances or staying awake as a passenger in a car or sitting down to watch TV, things like that. Bernie Miller – 23:50 – oh yeah, narcolepsy is a neurological disorder and there really isn’t any cure for narcolepsy. But what happens with narcoleptics is they’ll actually be talking to you and enter REM sleep and you remember I mentioned that rem sleep and sustainer paralysis. So what happens is they’ll have what they call a cataplectic attack. So they will stand there and they’ll be talking. All of a sudden they’ll just collapse and that’s because they lose that muscle tone by going into REM sleep. So unfortunately there is no cure for narcolepsy. So it’s important to diagnose those people and get them treated, you know, correctly. Sean Tierney – 24:29 – Well, I don’t have many more questions. I mean this is like, there’s so many avenues we could go down here, but I guess it’s really a matter of, of, of you know, what’s going to be the most useful? When is it appropriate to seek a sleep study? If you feel like you’re not getting good sleep is, uh, is there anything you do on your own or at what point do you actually say, okay, I’m going to go to a doctor and actually get this checked out? Bernie Miller – 24:56 – Yeah, there’s even some apps available now or you can log on and answer a couple of questions. Um, as a matter of fact, I read that soon. Apple and the Apple Watch is going to have a diagnostic tool. Of course it’s not diagnostic officially, but that’ll, if you wear it for a week, it’ll tell you that whether or not you have sleep apnea. There’s also a couple of devices. Um, one company makes a device that you set on your nightstand that emits radio waves and it actually can pick up periods of, you know, when you stop breathing and things like that. So there’s a number of a thing you can actually do to self test. And then of course you would have to see a sleep specialist because there’s a number of different therapies that you can use depending on the severity of what you have, you know. So. But yeah, once you suspect something, I would look up my local sleep specialist and go see them and then they would decide if testing is required. Sean Tierney – 25:55 – Got it. Just one more just because this tends to coincide with what I’ve seen in these groups. Um, you know, alcohol is a very real thing. Like there’s people that all come together in these nomadic groups. They’ll go out and they’ll party. What is the effect of alcohol? It makes you feel like you can go to sleep. But my understanding is that it gives you a not as restful sleep when you go to bed drunk. Sean Tierney – 27:01 – I can say anecdotally unrelated to that alcohol, like I have a deviated septum from a fight a long time ago and I found that something that I didn’t know I would get like dehydrated. I’d wake up and you know, obviously you have to get up and you have to drink and then you have to pee and then you have to go back to that. And just like this vicious cycle of keeping you awake. Something that I found that helped me was those nasal strips that would like stent your nose open enough where I would actually be able to breathe through my nose and not be breathing through my mouth. Bernie Miller – 27:30 – Breathe right strips. They actually, uh, in a couple of studies that they did, they decrease nasal airway resistance by about 30 percent. So they do work. There’s certainly not for sleep apnea or anything like that, but they do, they do help with people with deviated septum and stuff. Yup. So yeah, they actually do work for that. Sean Tierney – 27:51 – Yeah. So maybe if you’re listening and you have issues, maybe give that a try. It did help me quite a bit. So I’m just relating that here. Bernie Miller – 27:59 – I’m sure I would say if you do snore with one of those devices in place though, and you still snore, then you got more of a problem. We can see a sleep specialist for that. Bernie Miller – 28:17 – could be. I would definitely see somebody for that. Sean Tierney – 28:20 – Okay, great. Well Bernie, I don’t have any other questions I was going to bring up. Thank you for your service. Like I watched the video we were talking before you got on here. I know you’re a vet, your son. There’s a video, I’ll link it in the show notes of Bernie’s son coming back from Afghanistan. He was as well in the service and it’s really kind of a tear jerker and uh, it’s all linked out here if you want check it out. But thank you for your service. Bernie Miller – 28:46 – You’re welcome, Sean. Thanks for posting. The thing about the video too. That’s pretty. It’s pretty awesome. It does make the rounds every now and then for sure. Sean Tierney – 28:54 – Yeah. Well it’s, it’s really, uh, it’s touching. Yeah. I, I doubt many people have a dry after seeing it, so I’ll link that. You’re awesome. We’ll bring it. I know you’re very busy. Thank you so much for your time. I really appreciate it. Bernie Miller – 29:08 – Sure. If you need anything in the future, Sean, let me know. This was fun. Sean Tierney – 29:12 – Okay. Will do. If people have questions on this episode, are you up for maybe a answering those if I send those to you? Bernie Miller – 29:19 – Sure, no problem. Sean Tierney – 29:21 – Okay, awesome. Well thank you so much. Bernie Miller – 29:24 – All right, Sean. Thanks a lot. Bye. Sean Tierney – 29:28 – Okay, that was my conversation with Bernie Miller. He has agreed to answer any questions. So if you have any, go ahead and leave them. Under the episode is a comment written comment or a video comment, uh, and if you think you might be suffering from a disorder, talk to your physician and see about setting up an appointment with a sleep specialist to get that looked at. Okay, so as I mentioned at the end of the last episode, I’m going to be taking a bit of a break from content production. Uh, we’re going to do one more guest. I have Alex Hillman of the 30×500 Academy is going to be joining us. This is an online course for budding entrepreneurs to help you get to your first $10,000 in sales on whatever side venture you’re launching. Um, so it’s a, it’s a very interesting course. I know a number of people who have gone through it and have nothing but good things to say about it and it can help you basically avoid a lot of pitfalls. And in the nomadic scene I touched a lot of people who are interested in starting their own thing. So I think this will be of interest to a lot of people. Sean Tierney – 30:24 – So if you looked at starting your own business, this is definitely an episode you’re going to want to catch a. and then like I said, after that I’m gonna, take a little bit of a break, pause the content production and I will let you know if you’re subscribed. Then you’ll, you’ll get the next episode whenever that is. Okay, so a little bit of housekeeping here. If you’re considering doing a nomadic travel program, you can save up to $300 off select programs simply by applying via our discounts page. You’ll find that link in the footer of our site under a program discounts or simply go to nomadpodcast.com/discounts. To apply for any of the available programs, know that if you do apply directly to the program itself, it doesn’t validate your opportunity to get this discount, so be sure to apply via the form on our website. Sean Tierney – 31:08 – Nomad podcast is supported in part by nomad prep, an online academy for aspiring digital nomads taught by yours truly that teaches you everything you need to know to make the transition to the digital nomad lifestyle. Get the first four days of this two week program completely free by going to nomadprep.com/podcast. Nomad prep. Take your job on the road and take on the world. If you are a blogger or a travel blogger, we have a platform now that you can apply to and get your content syndicated to reach a wider audience. 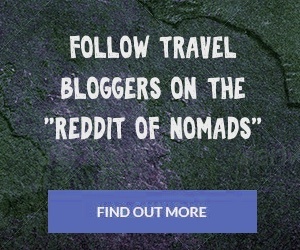 So we go to nomadbloggers.com and click on the blue submit link in the header to add your blog if you’ve enjoyed the content. Yeah, the greatest compliment you can give is just to share this to your friends, so consider sharing it on your Facebook, on your Instagram, maybe your Linkedin, Twitter, whatever you use. Sean Tierney – 31:56 – I would love for you to just spread the word and help get some more listenership for the podcast. I’m also leaving a rating and a review helps a lot that, uh, so whatever podcast platform you’re listening on, if you are, or if you’re watching on Youtube, then this doesn’t apply to you. But if you’re listening on a podcasting platform, please consider leaving a rating and review as it does help grow our listenership. So as always, thank you for listening. Thank you for supporting this effort. I hope you find it useful. Like this is all pro bono at this point, but it’s for a good cost. So until next time, it’s a big world out there. Get out there and explore it. I’ll see you on the road. Speaker 1 – 32:35 – Nomad, nomad, nomad podcast.